Amid all that globe-hopping, did Bond visit Wheaton, mistaking it, perhaps, for Monte Carlo? He came closest in Benson’s brief tale, “Live at Five,” which places the Brit in Chicago on a mission. Fleming himself once visited the Windy City, touring mob-related hotspots; and the Ian Fleming Foundation is currently located not in London, Rome or Paris, but in Kankakee, Illinois. However, Bond’s other literary and cinematic guardians are aware of us. 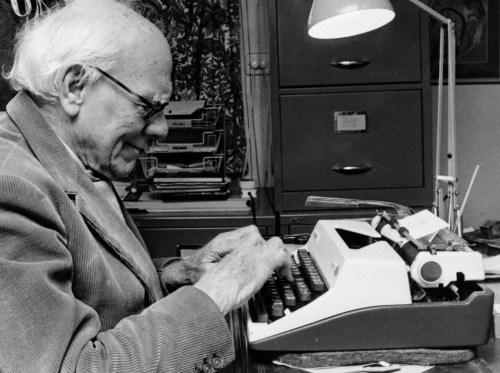 For instance, in his Memoirs, Amis — who penned the 007 pastiche Colonel Sun and allegedly finished The Man With the Golden Gun, incomplete at Fleming’s death — laments the absurdity that Malcolm Muggeridge’s typewriter is displayed “…in a glass case as part of a collection…including T.S. Eliot and C.S. Lewis.” (Actually, the typewriter is in Special Collections SC-04.) Another contributor to the 007 mythos is Bono, who visited Wheaton College with his entourage in 2002, drawing attention to the AIDS crisis in Africa; he is co-lyricist (with The Edge) of the title song for Pierce Brosnan’s GoldenEye, sung by Tina Turner. There is Marvin Hamlisch, who conducted the campus orchestra for the Artist Series in 2004; he achieved fame composing music for several hit films, notably the soundtrack for Roger Moore’s The Spy Who Loved Me. And then there is Dr. Michael Ward, C.S. Lewis scholar and author of Planet Narnia, who has spoken at Wheaton College. Portraying Q’s assistant in The World is Not Enough, Ward hands Pierce Brosnan a pair of x-ray sunglasses.